iPhone users have iTunes, but Android users must figure out their own syncing arrangement. Of the numerous Android syncing programs out there, I recommend trying DoubleTwist first. DoubleTwist reliably gets the job done with minimal hassle. I've found no other comprehensive media-syncing tool that costs nothing, offers such a clean and functional interface, and works with most Android phones. What's more, if you're willing to shell out $5, you can pick up a companion app that enables Wi-Fi syncing. Here’s how to get started. Step 1: Download and install DoubleTwist for PC. 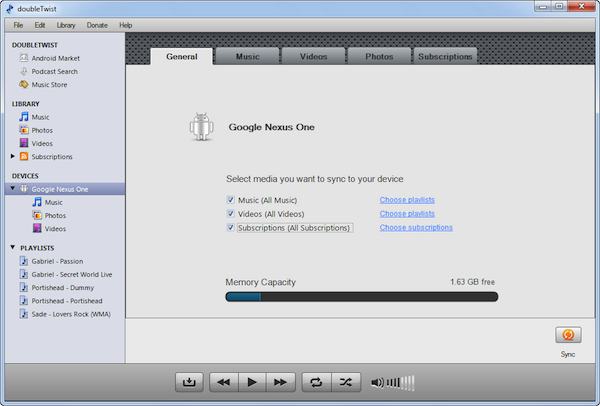 Although a free DoubleTwist media-player app is available for Android, you need only the desktop version to set up sync. Step 2: Launch DoubleTwist, and it will scan your PC for media. You can import music, photos, and videos that the program does not automatically find, as well as playlists from iTunes and Windows Media Player, by exploring the Library menu. Step 3: Connect your Android phone to your PC via USB, and then click the status bar and set your phone to USB Mass Storage or Disk Drive mode. You’ll see your phone under Devices in DoubleTwist. Syncing music and photos with DoubleTwist. Step 4: Click the name of your Android phone to open sync options. You can sync all or part of your media collection by browsing tabs (Music, Photos, Videos), choosing options, and clicking the Sync button. Notice that you can have DoubleTwist import new media from your phone during the sync. If you prefer, you can also drag and drop individual files between the DoubleTwist Library and your device. If you want to enable wireless sync with the $5 DoubleTwist AirSync app, you can set it up in three easy steps. Step 1: Connect your computer and phone to the same wireless network. Step 2: Launch AirSync, and select Yes to set up Wi-Fi pairing. Step 3: Click the name of your phone under Devices in the DoubleTwist desktop program. Enter the passcode displayed on your phone. You can now perform the same syncing operations described above. Having problems syncing? Note that DoubleTwist will not transfer files protected by DRM.